KORONADAL CITY—Department of Social Welfare and Development in Region 12 received recently the latest state-of-the art satellite telecommunications and connectivity equipment as part of its continuing efforts to improve disaster-response operations. Bai Zorahayda T. Taha, DSWD 12 regional director said that the technology acquired by the agency is a result of collaboration with the International Partnership Program (IPP) of the United Kingdom Space Agency (UKSA) produced by British mobile satellite company, Inmarsat. “As we try our best to fulfill our commitment for prompt services and responses, we need to strengthen our access to timely and accurate information, especially during disaster. We are thankful with this newly-acquired equipment,” Taha said in his brief message during turnover ceremony. Director Taha officially received the equipment from DSWD Central Office through Rodolfo M. Encabo, Director IV of Disaster Response Assistance and Management Bureau (DReAMB). The turned over equipment includes satellite phones, manual and auto-pointing Broadband Global Area Network (BGAN) terminals, and Global Xpress terminals, a powerful and highly portable satellite terminal which can provide high-speed internet connectivity even in remote locations. “These various gadgets will be of great help to have an uninterrupted communication between our central office’s rapid emergency telecommunications team that is reporting to various response teams at various levels. Prompt communication means prompt response to disaster,” Director Encabo said. The Council for the Welfare of Children (CWC) enjoins the support of member agencies, partners and stakeholders for a meaningful celebration of the National Children’s Month celebration through the conduct of activities aligned with its theme for 2017, Bata: Iligtas sa Droga! This theme which was approved by the CWC Board on 31 July 2017 is in support to the administration’s fight against illegal drugs. Republic Act No. 10661 declares the month of November of every year as National Children’s Month (NCM). This declaration commemorates the adoption of the Convention on the Rights of the Child by the United Nations General Assembly on 20 November 1989, and seeks to instill its significance in the Filipino consciousness. CWC has ongoing discussion with the Department of Social Welfare and Development (DSWD) and the National Youth Commission (NYC) as co-lead agencies in the preparation for this year’s celebration. Based on the R.A., they are authorized to call upon any department, bureau, office, agency, or instrumentality of the government including government-owned or controlled corporations, for any assistance as may be needed in the discharge of the tasks. Koronadal City—“Dahil sa layo ng aming lugar sa bayan, hindi na umabot ng buhay ang aking isang anak habang papunta kami sa pinakamalapit na ospital dahil sa sakit na diarrhea,” (Because our village is far from the town proper, I lost my child while on our way to the nearest hospital) says Aurelio C. Candado, 56, a resident of Barangay Villamonte, Lebak, Sultan Kudarat. Villamonte is located in the northeastern part of town, which is 42 kilometers away from the town proper and considered as the farthest and hardest-to-reach village among 27 barangays of Lebak. Agitating the situation of Candado and the rest of the villagers of Villamonte, is the fact that they need a huge amount for vehicle rental in order to bring a person who needs immediate medical care to the nearest hospital, ranging from P6, 000.00 to P7, 000.00. The struggles of Villamonte’s villagers will soon to be thing in the past after their proposed one unit rescue vehicle with amenities amounting to P P1.35 million has been chosen as one of prioritized projects during the town’s recent municipal inter-barangay forum (MIBF) conducted under DSWD-Kalahi-CIDSS Program in towns of Lebak and Kalamansig, Sultan Kudarat. MIBF is a prioritization process employed by DSWD Kalahi-CIDSS in which instead of local officials that determine which villages will avail the funds and projects; it is given in the hands of ordinary people of barangays. Other community projects that will be funded under the Program in Lebak town include garbage compactor truck (P.62 million) of Poblacion III, T-breakwater (P4.24 million) of Tibpuan, health centers of Christiannuevo (P1.2 million) and Bolebak (P1.57 million) and an evacuation center (P1.87 million) Barurao-1. Village of Poloy-Poloy will also soon have rescue vehicle (P1.35), solar street lights for Pasandalan (P2.22 million) and Pansud (P1.71 million) while Purikay villagers will soon have water refilling station (P1.31 million) and water system for Nuling amounting to P502 thousand. Pearly Santillana, the town’s area coordinator said that these projects, which are in far-flung communities , are considered to be most pressing needs with the total amount of P20.65 million. “We hope that these projects to address the struggles of villagers and be the vehicles to access other government services and programs,” Santillana said. Meanwhile, Genelyn Concemino, the town’s program area coordinator in Kalamansig said that some P18.85 million of community projects will be benefited by 11 villages under DSWD Kalahi-CIDSS Program. Concemino said that villagers of Santa Maria will soon have training center with amenities (P2.10 million), a rescue vehicle with amenities (P1.34 million) for Hinalaan, while darkness will soon to be thing in the past for villagers of Obial and Cadiz with solar street lights amounting to P1.69 million and P1.68 million, respectively. Solar driers will also be constructed in villages of Datu Wasay (P2.05 million) and Sangay (P2.95 million), birthing clinic in Limulan (P1.49 million), sanitary toilets and pitcher pumps in Dumanggas Nuevo (P1.47 million), and nutrition health posts with amenities in Datu Ito Andong (P1.29 million). Concemino added that villagers of Nalilidan and Santa Clara will have potable water system amounting to P1.44 million and 1.30 million, respectively. Kalahi-CIDSS, which stands for Kapit-Bisig Laban sa Kahirapan-A Comprehensive and Integrated Delivery of Social Services, is a national community-driven development program of DSWD in partnership with the local government units. COLUMBIO, Sutan Kudarat—In the shadows of the verdant richness of the hills and picturesque trails of the remote mountainous village of Eday, life of poor Blaan’s was a far cry from the development in lowland communities. Plagued with famine, unstable peace condition, absence of livelihood means, illiteracy and inaccessible roads, everyday, villagers struggled to meet both ends and other life’s essentials. For many times, residents ended up fleeing their homes because when government troops and rebel group had encounters. This lent Eday, a 100% Indigenous Peoples community of Columbio town, Sultan Kudarat, the dubious reputation of being a “no man’s place” during times like these. Some, homes were partially or totally destroyed while others were burned down. Their domestic animals like carabaos, cows, chickens were stolen as wells as their crops. Tired of picking up their lives all over again, many B’laans decided to settle to other villages and left Eday permanently. Despite the situation, Marcelo Gusanan, 42, was upbeat that that someday, his village will be a better place for native people like him. Marcelo led B’laans and knocked the doors of different organizations begging for help to intervene their situation. Many responded. Unfortunately, there were others who took advantage the situation. There were organizations who promised assistance and services like housing, jobs, livelihood, even collected some amount to B’laans to facilitate the aids but later it turned out to be fraud and were only used for funds generation. “Siguro, naisip nila na mga illitirate kami, mas madali kami matuntuhan,”(They thought that were were illiterate and we were gullible) Marcelo said, which also for him, the most painful part of being an IP. Their experiences hurt them so much, that it instilled them not to trust to anybody coming to the place. 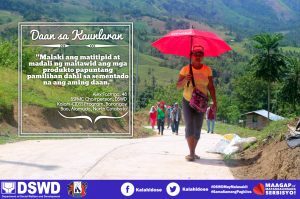 When DSWD introduced to the community the Kalahi-CIDSS, a community-driven development project of the agency that aims to bring together villagers so they can work cohesively and transparently to move toward progress, it was first greeted with suspicion and doubts. “Sa isip namon, isa na naman ka modus,” (In our mind, it was another type of modus) Marcelo recalled. Later, after series of meetings and orientations, as village leader, he was the one who convinced the B’laans to participate the activities. Marcelo served as a volunteer, took some initiative to have house-to-house information drive to the community. As a volunteer, together with other B’laans, he underwent various trainings in preparation for their eventual implementation of their chosen project-a school building. As one of the only three high school graduate in the place, Marcelo pinned his hope on education as one way to improve the living condition in the community. Majority of the the older generation of B’laans in Eday are illiterate. “Nakita namon nga ini isa ka opotunidad para ipakita sa iban kung ano ang kaya namon,” (We saw this as an opportunity to show to other people of what we are capable of doing) Marcelo said. “Gusto namon ipakita nga kaya man namon magtindog sa kaugalingon namon,” (We wanted to show that we can stand in our own as an IP community) he added. For many B’laans in Eday, the simple act of giving them opportunity to speak in front of other people to share their ideas can be life-changing experience. Trust, according Marcelo, means everything for B’laans in Eday. It is the foundation of development and initiative for IP community. He used this trust to drive their own development. Marcelo developed his leadership skills through various community capacitating activities and led in harnessing “people’s power” through volunteerism among B’laans. As an advocate of community-driven development (CDD), Marcelo make villagers understood that leaders have obligation to consult, report, explain, that all groups, particularly the most vulnerable, should have opportunities to participate in the process, who are answerable/accountable for the consequences of decisions and projects it has made for the community. He encouraged the community, by his example, to work together to reach a common goal, working beyond what was expected to them, inspired to complete the tasks ahead of schedule, and rekindled the bayanihan spirit that was worth emulating. As an IP leader, he let the community decide, ensured in providing the villagers the opportunity to directly take part in the project implementation process, and this included having control over community finances. In fact, in their first subproject, because of their strong sense of participation, they were surprised that they had almost Php100, 000.00 savings after the project completion of the classroom building. The excess money and materials were enough to construct the school’s stage and water reservoir, benefiting hundreds of pupils. Because of the success of their first project, they were given opportunity to implement other projects like water system, solar drier with warehouse under Kalahi-CIDSS and become a model of some other barangays. Different national and local agencies also brought their projects resulting to a rapid development in the place. Seeing the new Eday, Marcelo recalled that moment when he was told to leave Eday. His decision to stay in the place was inspired by the idea that development is innate in the communities. What was only needed, according to him, to kick-start the process of active participation and engagement of the people. He never imagined that it would change the lives of B’laans of Eday. He was recognized as 2016 Search for Outstanding Volunteers of the Philippines for Adult Category by the Philippine National Volunteer Service Coordinating Agency. Gusanan was also recognized by DSWD as Best Community Volunteer during the 2nd BayanI Ka! Awards of Kalahi-CIDSS Program for 2016, taking the center stage to share the voices of B’laans that often neglected. Koronadal City—The Department of Social Welfare and Development in Region 12 has recognized outstanding individuals recently for their exemplary contributions in the development of their respective communities in Maitum town, Sarangani Province. Bai Zorahayda T. Taha, DSWD 12 regional director said that the awardees are those of ordinary citizens with extraordinary achievements in making community-driven development a reality. The recognition is dubbed as BayanI Ka! Awards, an initiative of Kalahi-CIDSS Program of the agency, given to its partners in its quest to reduce poverty, improve governance and empower local communities, Taha explained. “These are our unsung heroes who continue to build hope and change the lives of many people through volunteerism with their respective advocacies,” Taha said. Among the awardees include Liza D. Rusiana for Gender Category, Bautista C. Agbay for Environment Protection Category, Kubli M. Kusin for Indigenous Peoples Category and Merlie M. Sornito for Improved Local Governance Category. The criteria for selection and judging the recipients are based on their Bisyon, Aksyon, Yakag, Abilidad, Ningas, Inspirasyon or BAYANI. Menawhile, Barangay New La Union was hailed as Best Bunicipal Local Government Unit while Kabalikat Civicom 499 Chapter bagged the Best Organization for Bayanihan Category. The agency also recognized the outstanding individuals in the implementation of other programs including Pantawid Pamilyang Pilipino Program and Sustainable Livelihood Program. The awarding activity was organized by municipal action team of Maitum, a group of DSWD’s staff from the three-core programs of the agency. As a CDD program, Kalahi-CIDSS build up on empowering the citizens and tightening their links with their LGUs so that they can work together to ensure their villages’ progress.